Ever been told you’ve got the perfect face for radio? No? Good, then you’ve got two days left to enter yourself in Dove Spa’s latest campaign. Dove Spa are searching for women to appear in this year’s ad campaigns – so if you think you’ve got what it takes, you could stand the chance at winning £250 in vouchers and getting your face featured across high streets nationwide. 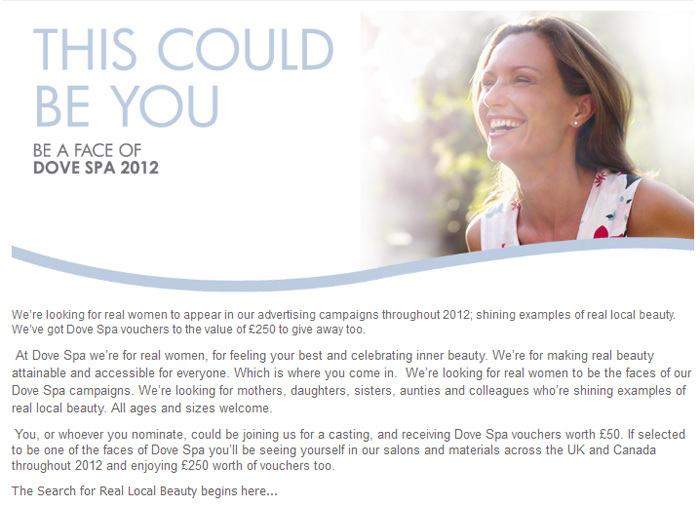 There’s only two days left before entry closes, so if you want to nominate yourself (or someone you love), get your entries in by email to realbeauty@dovespa.co.uk by the 17th February 2012. Simply submit a photo of the applicant and a paragraph detailing why you/they should win! Kate Moss eat (not bloody likely) your heart out! Hmm, seems like not a lot of money compared to what a ‘real model’ would make. But I love the idea of using a normal, everyday woman! Can’t wait to see who wins!